If you’re looking to increase brand awareness and reach your targeted audience with impact, plane advertising is the right choice for you. Our national flying banner advertising capabilities offer a wide array of creative options for marketers looking to stand out in an increasingly fragmented landscape. With a plane advertising banner, you can cover an entire crowd all at once and get impressive retention rates, all from a single placement. What Type Of Events Can A Van Wagner Aerial Media Banner Plane Fly? Van Wagner Aerial Media is the industry leader in the aerial towing business. Our pilots fly plane ads and banners in markets from coast to coast. 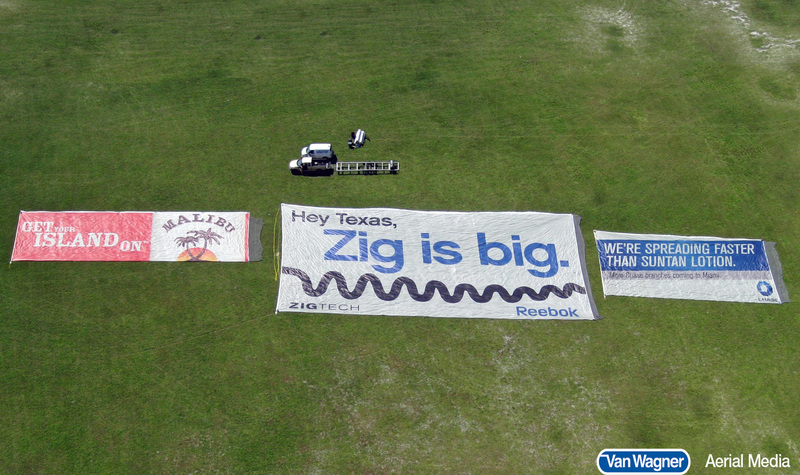 With airplane banner towing and other aerial media, you can blanket the skies wherever your audience is. Click on the links below to learn more about the different aerial banner advertising opportunities. Why Choose Van Wagner Aerial Media (VWAM)? At VWAM, we pride ourselves on creating customized programs featuring premium displays to fit the exact needs of our clients. 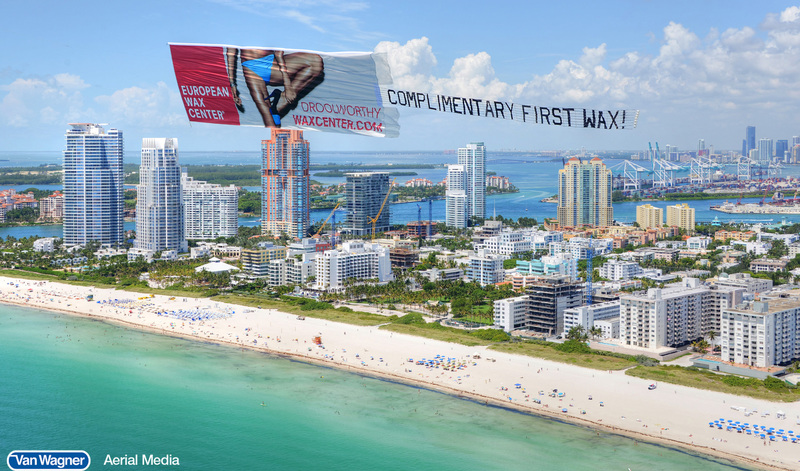 Our aerial ads aren’t the typical proposal letter banners that you’ve probably seen out at the beach - they’re the biggest aerial banners in the industry. Our marketing and aerial experts can turn your latest campaign into an eye-catching aerial sponsorship with airplane advertising. Turn text and visual ads into the right plane banners and airplane signs, so you never lose a moment of branding. Click on one of the aerial banner sizing options below to learn more. You can also watch a YouTube video of our banner production process by clicking here. Airplane banner advertising is our passion, and we bring a new level of expertise to every ad we fly. From national reach to custom campaigns and more, we are the airplane advertising partner that will take your business to new heights. VWAM planes are the only planes in the industry specially modified to tow aerial banners at an angle. This unique adjustment not only reduces the amount of wrinkles on your aerial banner, it also ensures that potential customers on the ground can read your aerial ad clearly. At Van Wagner Aerial Media, you’ll always have an exciting banner-towing advertising experience with a clear message for the crowd below. Our full service team of industry experts is available 24/7 for support. Need feedback on your ad’s creative or messaging? We can help. Want to know which type of event you should target to fit your consumer demographic? We’ve got you covered. Our consultants provide the tools you need to get the return on investment you are looking for. Whether it is a traditional airplane advertising banner or some of our unique aerial banner offerings, we can create a custom strategy to deliver the best aerial experience for your intended audience. Our planes are fully-insured and piloted by the industry’s most experienced team of aerial advertising pilots and our entire fleet is GPS equipped to provide precise, timely proof-of-performance reporting that can be tracked in real time. Don’t worry about the weather! If we can’t fly a certain event due to rain, excessive wind, or snow, we will make it up to you! Your airplane advertisement will fly high above your target demographics, and we’ll always make sure our airplane banners are easy to see from the ground below. Have questions? We can answer them. Contact us today or get your free quote by clicking below! Click here for case studies about our aerial banners.